We had a lovely holiday with our family out of state. It was a great trip full of good food, great family and fun memories. Oscar had a blast with his family and we were full of love and ready to hit the road home yesterday. We got an early start for our 12 hour drive. We knew it was a long day. Well, we thought we knew. 2 hours into our trip we decided to stop for a potty break and to let Oscar play. We went to McDonalds because they have a play area. We had a lot of fun and Oscar loved playing on the playground. This particular one had a sign that said parents could play too, so Jerry decided to take him down the slide on his lap. Oscar loved it and wanted to go again! We decided they could go one. more. time. and man, if we could just take that back. It was a tube slide and this time as they went down, Oscar kicked his leg up and his shoe caught on the slide while their bodies kept going. This resulted in a small fracture and a full leg cast. For a 23 month old. Thank God we were only a few minutes away from a local Hospital and Oscar was seen and treated immediately. He should fully recover in a month or so and we know that it could have been much worse. We are taking each day as it comes and trying to make sure he is as comfortable as possible. As I was in crisis mode and dealing with things, trying to assess and reassess the situation I thought about the people who sue McDonald’s. I don’t know why I started thinking about it. Maybe my mind needed somewhere else to go. But I just couldn’t help but wonder why in the world that would be helpful. There is nothing in me whatsoever that blames the company for Oscar’s injury. And in fact, since we have been home and I’ve had access to Google, you can imagine my shock when I read several articles warning against parents going down slides with their children! While it is so sad that any child should break a bone in any way, it was somewhat comforting to know that we are not the first ones to have this freak accident. I am so thankful that Oscar is safe and will heal and didn’t experience something more damaging. And I don’t care where the event took place. Accidents are accidents and we place no blame. I decided to type out our experience as a warning. I don’t know if we would have acted differently had we seen those articles prior to our stop. I mean there is part of me that knows you can’t live in a bubble. But at the same time, they make a good point. Children going down the slide on their own wouldn’t have the same kind of momentum. And we live and we learn. My heart broke this morning when Oscar cried “walk mommy!” and I had to uselessly explain that he couldn’t walk for a little while, but that it wasn’t forever. For some kids, it is forever. I can’t even imagine. Today, we are home. We are thankful for every breath. Every sigh. Every request to “watch someping”. We have our boy. He’s a little banged up. OMG! I had no idea yiu guys were traveling when this happened! I am so glad he is okay, albeit not at 100% yet. That must have been so scary for you guys, whew. I am happy to hear he should be back to normal in a month, though I am sure that will be seeming like ages for the lil man. Whew.so sorry you guys had to go through this! Oh Andrea, what an ordeal! I’m so glad the little man is going to be ok. I can’t imagine having A in a cast like that. I see library trips in your future to get lots of “NEW” books. Do ya’ll need anything? Hugs to you, Jerry and Oscar. I hope this month goes by REALLY fast. Oh my heart is breaking for him. Poor little guy. How in the world did you keep it together, Andrea? I’d have been a mess. I hope this month goes quickly and that it’s full of lots of too-cold-to-go-outside weather. Oh, and according to my husband, this is the time to take him to Disney. Kids with casts go straight to the front of the line. My husband speaks from experience. Brave little boy and super brave mom and dad. There is nothing scarier than being in the ER with your little one. Thank you for posting this. Oh Andrea…I’m so sorry. I bet in a day or two he isn’t even going to notice the cast on his leg. Little ones are so resilient! Oh honey! I am so out of the loop and cannot believe this ordeal you went through and traveling no less. I am so sorry, but I am so happy he is okay! Hugs to you and the little man! Julesy broke his leg when he was 21 months old. He was just walking along, twisted the wrong way, and snap! 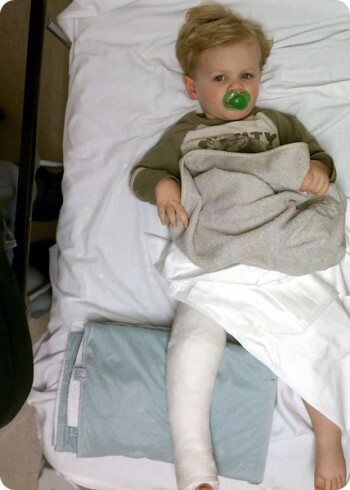 It’s sooooooo sad to see a baby in a cast, and it can be soooooo frustrating for them. Here’s hoping for Oscar’s speedy recovery! Thank you so much for sharing with me. It is so hard to see him struggle but he is just himself and it brings tears to my eyes to watch him adapt so well. Uh maybe im wrong here but it is people who make me sick. I feel like you are trying to make money from your kids, sorry to say but common injury. This stuff happends while it is hard o you. It is tuff for the kid too. The fact that your putting your energy into suing someone and not into how you could make him feel better is just wrong to me. Things happen if you dont want anthing to happen i would suggest a bubble or you could just never let him go out. You clearly did not read the post, you weirdo. She would not consider suing the company and, in fact, was solely discussing how crazy it is for people to sue a company for things that are irrelevant to the way a company has acted and that it would not make the situation or the child any better. It’s people like you who make me sick, Jenny, ya little know it all. Great advice… For someone senselessly suing a company. Geez.